Vehicle entry is free of charge and is available for cars, tractors, steam, commercials, motorcycles, stationary engines, buses, military and model steam. For further information please contact Lucy Hegarty on lucy@kentshowground.co.uk or phone 01622 633052. http://www.kentshowground.co.uk. 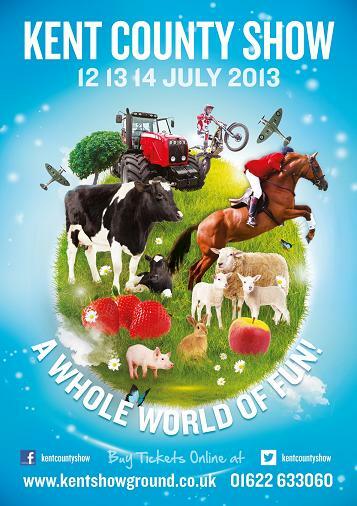 Kent County Show is the region's showcase event for farming, countryside and rural life. The three day show brings together the very best of Kent with animals, food, fun and excitement giving a true feel of what �The Garden of England� has to offer. Experience the Flower Show, Food Tent, Canine area, show jumping, vintage vehicles and hundreds of cattle, sheep and goats. Meet Titan the Robot, watch the Metropolitan Police Horses, listen to live music and see the Kent Spitfire flying overhead.